Throughout the course of history worldwide, the public school has, as much as a town square, a city hall, a library or similar community fixture, served as an anchor point of a neighborhood, fulfilling not only its purpose as a facility of education but also as a central cultivator of local civic pride and participation. It also raises a smoke screen, or rather, a series of smoke screens. Hidden behind them are the facts, and they directly contradict SFSOS’s arguments. This campaign by SFSOS is not new. The organization raised the possibility of a ballot measure last year to return the city to a neighborhood-school system. But this year, now that time may be running out, it has redoubled its efforts. Beginning tonight, when the Community Advisory Committee on Student Assignment reports to the School Board, the subject is up for discussion and decision. According to the Examiner, “two of the three new possibilities for school assignment do not give an advantage to underprivileged or minority students, resulting in more opportunity for students to get assigned to schools within their neighborhood.” Ackerman says she’ll stay on the sidelines, leaving the Board to deal with the angry hordes that SFSOS has stirred up. … in 2005 the “diversity index” order will expire, allowing the Board of Education to replace it with another student assignment mechanism in 2006. In 1978, the San Francisco Chapter of the NAACP sued the school district in federal court, charging that the city’s schools were segregated and the educational system was therefore unfair. The NAACP won. And the SFUSD agreed to the terms of a federal consent decree to remedy the situation, leading to school assignments based on the diversity index, which has apparently endangered the city’s children by making them ride the bus. The decree is due to expire in December 2005. The most important trend to emerge from our research is the evidence of positive growth and change — consistent with Consent Decree goals — over the past five years. While this positive turn of events is very encouraging, it must be noted that there are still some basic Consent Decree compliance issues that need to be addressed. In the area of desegregation, the district is substantially in compliance with regard to school-by-school desegregation, but the same is not true with regard to desegregation of programs and individual classrooms. In the area of academic achievement, the district has recently demonstrated significant and sustained growth in most of the relevant sub-categories, but it has not yet completed the reforms that would enable it to achieve full compliance across the board. In general, the district is very aware of the complex problem areas addressed in this report and is not at all content with the status quo. Indeed, it is clear that SFUSD has done a much better job addressing these difficult issues than many other districts in the state with similar urban problems. That was in 1997. In 2001 the “Ho plaintiffs” successfully argued that the consent decree’s racial quotas were keeping some Chinese students out of prestigious schools like Lowell. The district switched to socioeconomic criteria in deciding which students would attend which school. 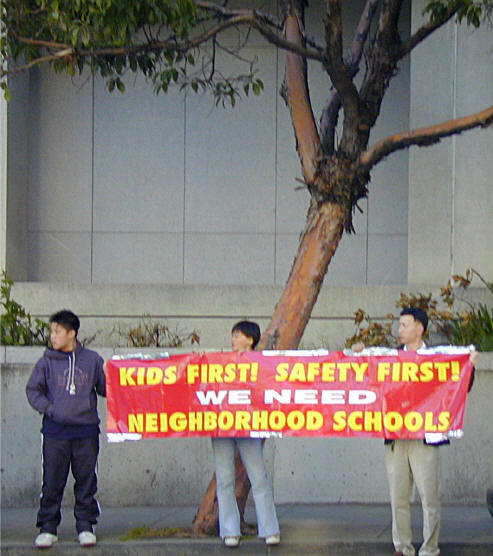 In 2004, SFSOS president Wade Randlett argued that the problem had been solved: San Francisco was providing good schools in all parts of town, and where they didn’t already exist, Ackerman’s Dream Schools would soon make them a reality. Yes. And a flock of pretty pink piggies just flew by my window. Our review of final Fall 2004 enrollment figures obtained from the District has revealed that the resegregation documented in our previous reports continues unabated. The number of SFUSD schools severely resegregated (60% or higher) at one or more grade levels increased again during the past year. In addition, as reflected in Appendix 1, the actual percentages of students of one race/ethnicity at these schools are higher overall than they have been at any time since resegregation began. In the first years of resegregation after February 1999, percentages of one race/ethnicity at the resegregating schools were typically in the 60-70% range. Now, however, more than half of the resegregated schools show 70% or more of one race/ethnicity, 10 schools show 80% or more, and at least five elementary schools are moving very close to 90% of one race/ethnicity at one or more grade levels. All three of the new Dream Schools are currently among the most highly segregated schools in the District. Of course, the hope is that these schools will improve, and will thereby be more likely to attract diverse student populations from across the City, in the same way that original “Consent Decree” schools Burton and M.L. King have done since 1983. But in the end, according to SFSOS, questions of justice may not matter anyway. You are losing money because of declining enrollment. Enrollment is down 40% since the 1960's, with 4,000 kids leaving in just the last four years. You are losing money because of declining enrollment! Yet over that same timespan the City population of school-aged children has remained static. So, you are losing money because of declining enrollment — because of something you are doing to push students away. Oh dear! Now those cute little piggies are building nests in the trees! Time for a reality check. Last week, the city’s Department of Children, Youth, and Their Families released a report, “Mapping the Future of San Francisco’s Services to Children, Youth, and Their Families,” which includes a section called “The Demographics.” The figures are anything but “static.” Since the 1960s, the city population of children has fallen from 181,532 (24.5% of the total population) to 112,802 (14.5% of the population). Private schools experienced an 8 percent decline during this same period. In the elementary grades the drop in enrollment ranged from 7 percent to 15 percent in SFUSD and 13 percent to 18 percent in private schools. Over the same period of time, San Francisco’s birthrate for women age 15 to 44 declined from 55.3 to 45.7 births per 1,000 women. Surely the School Board can’t be held responsible for the city’s declining birthrate! In light of our findings over the past eight-year-period, we have concluded that the current student assignment plan should be modified immediately, and that the relevant parties should seriously consider replacing it — in its entirety — as soon as possible. We continue to find that while the plan was a good faith effort to comply with the terms of the recent Settlement Agreements, it has clearly not furthered either the racial and ethnic desegregation goals or the academic achievement goals of the Decree. While all [California] cities show a gap between their overall scores and the scores of their African American students, the gap between San Francisco’s overall score and its score for its African American students remains 164 points, far and away the widest achievement gap of the seven major urban districts. This gap is 85 points higher than the gap in Sacramento City, 96 points higher than the gap in San Diego, and a full 118 points higher than the gap in Los Angeles. The parties to the decree have been instructed to file a joint response to this report by April 18. On April 20, the court will convene once more to consider what to do. This time, perhaps, without flying pigs.